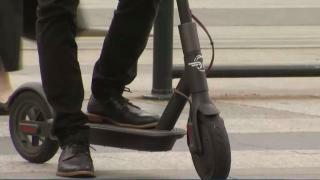 A suspect allegedly knocked a man off his scooter in downtown San Francisco on Monday evening and then rode off on it, according to police. The robbery occurred around 6:45 p.m. near Larkin and Hemlock streets, police said. The victim, a 22-year-old man, was riding his scooter when the suspect used his dog to push the man off. The suspect, described as a man in his 30s, then rode away and remains at large, police said. The victim was injured but did not go to the hospital, according to police.